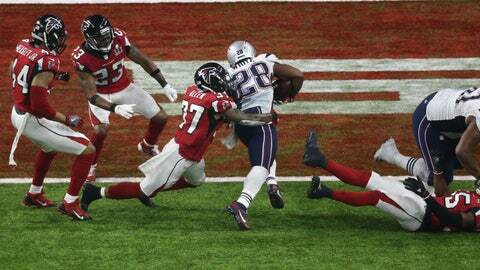 The New England Patriots won a thriller in Super Bowl 51 in the first-ever installment to enter overtime, which highlighted the NFL’s ridiculous rules. No one should state that the New England Patriots didn’t deserve to win Super Bowl 51. Any team that is able to erase a 25-point deficit in roughly 1.5 quarters deserves to win the game. What’s more, the Atlanta Falcons’ lack of depth caused them to “choke” that lead away. These are the facts and that’s the way things stand. However, Super Bowl 51 also brought to light one of the glaring issues in the NFL. Sunday night in Houston marked the first-ever Super Bowl to go to overtime. For that reason alone, the 51st installment of the Big Game will go down as one of the all-time greats, in addition to the incredible Patriots comeback. At the same time, though, let’s not think for a second that the game wasn’t over the moment that New England won the overtime coin toss. Part of that has to do with the momentum that the Patriots had working in their favor. After scoring 25 unanswered points to end the game, there was little hope of the Falcons being able to stop them—especially considering how gassed the Atlanta defense was. The other factor, though, is the completely ludicrous overtime rules in the NFL. Despite the change that a field goal no longer ends the game in overtime, that doesn’t change the simple fact that the NFL’s rules for the extra period don’t make an ounce of sense. In what way do rules that force the league’s MVP to watch helplessly on the sideline as his defense flails trying to stop an opposing offense and then not have a chance to answer make sense? The simple answer is that they don’t. If you look in any other league—professional or college—the overtime rules differ greatly from those of the NFL. Perhaps the closest to the NFL’s touchdown-wins-it rules are those in the NHL. In overtime for the NHL, the first goal wins. However, the primary and most obvious difference is the fact that both teams in the NHL have the opportunity to possess the puck via a face-off and likely throughout any amount of play. That’s a stark contrast to possession being determined by the coin toss before it being sudden-death rules. When you look at the NBA, MLB, or even NCAA Football, though, every other instance either involves playing a full extra frame in terms of or allowing each team to take possession. You would think that NFL would then take the hint when looking at that. But alas, the Patriots won the coin toss on Sunday night at NRG Stadium and won Super Bowl 51 because of it. Pointing out the idiocy of the NFL’s current overtime rules is futile without offering a solution. Frankly, there isn’t a simple way to go about that. Simply adopting the college football rules of alternating possessions from the 25-yard line wouldn’t work when talking about professionals. What’s more, you can’t ask professional athletes to play out a full 15 minutes—or even marginally less time—when you have a team like the Falcons already exhausted after 3.5 quarters of play. The answer may lie somewhere in between. Perhaps a system where each team gets possession from the 50-yard line would work, thus increasing the difficulty from college to the professional level. Or maybe alternating possessions that each begin with a kickoff would be something adequate. All that we know for sure is that allowing Bill Belichick and Dan Quinn play Paper-Rock-Scissors feels like a better way to decide a Super Bowl than not allowing the Falcons to have the chance to respond. Again, none of this is to discredit the Patriots. They are Super Bowl 51 winners, Brady and Belichick have one for the thumb, and Sunday night will go down as one of the best games in NFL history. It’s simply a shame that the ending was bogus because of the league’s ultimately arbitrary overtime rules.